Some situations call for a precise overview of which WLAN networks are available, as well as how strong the signals are. Wifi Analyzer is a great app for this sort of thing. Why, you ask? All will be revealed in today’s review! 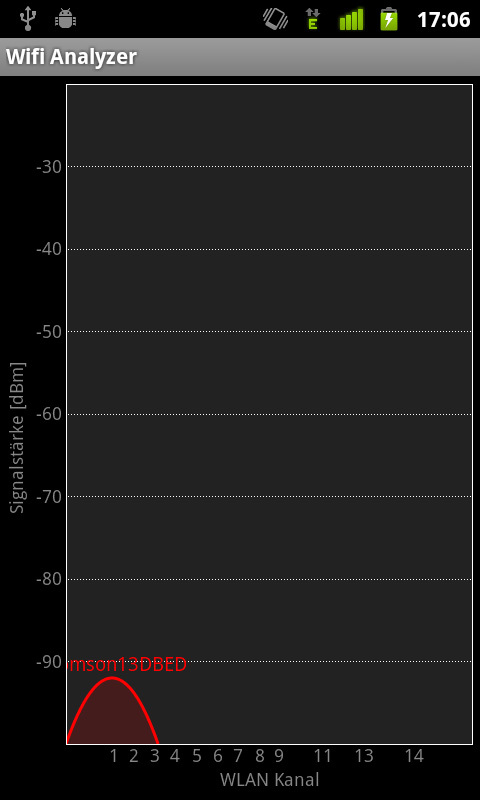 In a lot of cases scanning for Wlan signals in the Android menu does the trick, seeing as signal strengths are also displayed. But—sometimes this just ain’t enough! I helped a pal hook up his Playstation 3 to a Wlan hotspot recently, and was frustrated that the hotspot was located in the basement whereas the Playstation was on the ground floor. The signal strength was bad and we had to deal with constant disconnections. Wifi Analyzer really helped us sort the problem out. 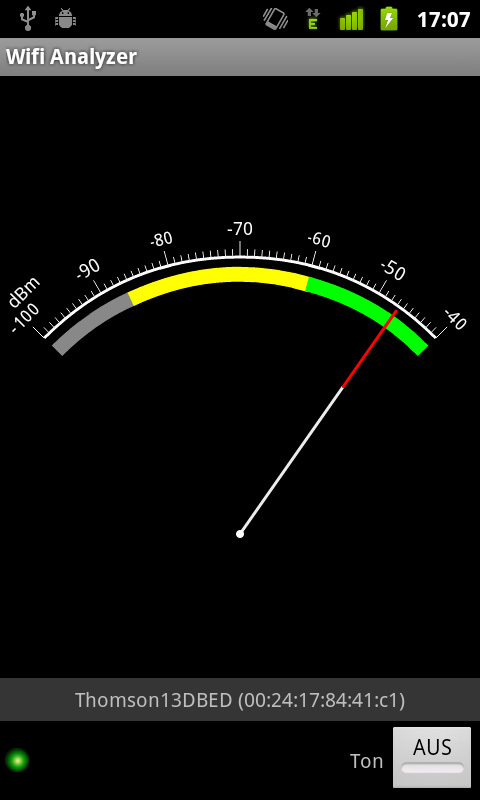 The app’s main function is to display signal strengths very accurately. Let me run you through how we did it: we threw together a Wlan amp (take a carton cut-out, cover it with aluminium foil and stick it on the router’s antenna). This helps focus the signal on one specific point, which in our case happened to be the ceiling. Whadaya know—the signal displayed by Wifi Analyzer was slightly stronger. All that was left to do was find the right angel for the antenna. The main drawback with the Android signal display is that it’s shown in four levels: a little dot (minimal strength) and three waves. As I said, in most cases this is all you really need, but in our case it just wasn’t detailed enough. The minimal strength was being displayed, whereas Wifi Analyzer shows minute changes. Channel overview: Displays all available networks, their names and signal strengths in the form of half elipses. Signal strength progression: A chart displays signal strengths. AP list: Networks and their signal strengths are displayed in the form of a list. Signal strength: Simulates a gauge indicator; only one network can be selected. A good solid four options there. Speaking of options, go to options (how often can one repeat the same words in 1 ½ sentences?) in order to set the scan interval, mark open networks and choose whether the app can de/activate Wlan automatically. This is no He-Man app by any means, but it’s a great tool for specific purposes. Changes in signal strengths are displayed very accurately—the app picks up on even tiny steps away from / close to the signal source. What’s missing? It’s not possible to make changes to the time interval which is preset. This is by no means the flashiest app I’ve ever laid eyes on, but that’s actually a good thing, because wild designs are absolutely not necessary for these types of apps—or have you ever seen an radioactive aerosol meter with crazy graphic effects? There’s room for improvement as far as the on/off button for sound goes. Aside from this, Wifi Analyzer is really easy to use seeing as the menus come in the standard Android format. Wifi Analyzer does really well in this category. The app starts up really fast, Wlan is activated really fast and as far as I could tell there was virtually no delay when it came to displaying stuff. Switching between different modes was also easy as pie. Wifi Analyzer can be downloaded for free from the Market. There are ad banners which can be deactivated for one week via the menu. Great app. Very helpful and detects even the slightest fluctuations. i can't think of many situations where I would need this app.